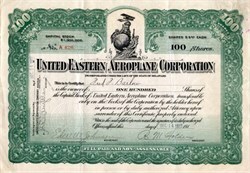 Beautiful stock certificate from the United Eastern Aeroplane Corporation issued in 1917. This historic document has an ornate border around it with a vignette by Theodore B. Starr, Inc of a bi-plane above the ocean with two gods looking with a ship at sea. This item has the signatures of the Company�s President, B. M. Holden and Secretary, Edward W. Johnson and is over 95 years old. 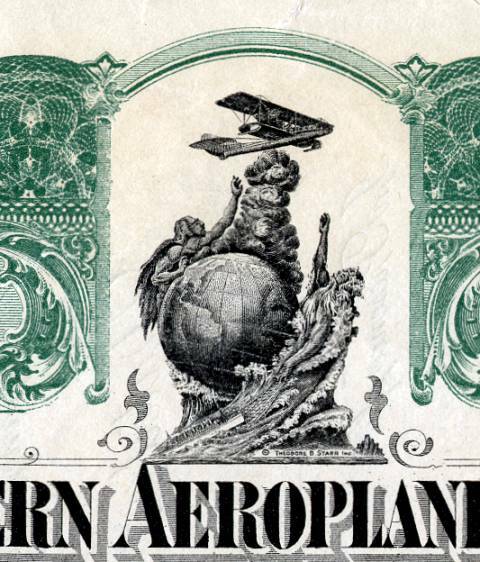 Organization and incorporation of the United Eastern Aeroplane Corporation has just been perfected and business begun at 1251 DeKalb avenue, Brooklyn, N. Y. This concern is capitalized at one million dollars, and purposes to manufacture all the up-to-date designs of airplanes for pleasure, military and commercial purposes, on a large scale. The incorporators include all the owners of the Eastern Aeroplane Company, Inc., with others, and the new companyhas taken over the old concern. Both the factory and aviation school heretofore conducted by the old company will be continued and enlarged. In the manufacture of its machines this corporation will use quite a number of improved devices for which patents will be secured. Some of these are already in use in the military tractor biplanes manufactured by the old company and used in its aviation school at Sheepshead Bay Speedway, and the new organization will continue to specialize on this make of machine. THE UNITED EASTERN TRACTOR BIPLANE. DURING the latter part of 1917, the United Eastern Aeroplane Corporation of Brooklyn, N.Y., U.S.A., turned out several very successful training tractor biplanes, a description of which, together with illustrations and scale drawings, we give herewith. The Eastern tractor has been designed strictly to Government specifications, and is, we are informed, specially noteworthy as regards workmanship and finish. The main planes are built up in five sections, two being attached to a smaller central section or panel, supported above the fuselage by four struts, comprising the top surface, and two attached direct to the fuselage, forming the lower surface. Eiffel No. 36 wing-section has been selected on account of the high L/D ratio, giving quick climb and high loading at comparatively slow speed. The planes are given a dihedral angle of i� and the top plane is staggered forward about 4 ins. The normal angle of incidence is about 30. The planes are built up in the conventional manner of spruce, spars and ribs of the lightest possible section. Two pairs of streamlined struts separate top and bottom planes on each side of the fuselage. The bracing is of Roebling steel cable doubled in the centre sections. Drift wires are taken from the forward ends of the upper fuselage longerons to the top of the front inner interplane struts, and from the forward ends of the lower longerons to the lower ends of the same interplane struts. The outer portions of the top plane extending beyond the interplane struts are braced from kingposts above these struts. Lateral control is obtained by means of a pair of interconnected ailerons, each 16 sq. ft. area, hinged to the top plane rear spar. The chord of these ailerons increases towards the tips, where the trailing edge is given a slight up-turn. The horizontal stabilising plane, 36 sq. ft. area, is of one piece construction, with raked ends and rounded corners. It is of the flat cambered, non-lifting type, and is mounted on the top longerons of the fuselage. The elevator is divided into two flaps, with the rudder working in between, and is constructed of steel tubing with wood ribs. The rudder, which is of distinctive shape, is partly balanced by a small surface forward of the pivoting post, and has an area of 15 sq. ft. The controlling surfaces are operated by standard dual stick and rudder-bar control. The fuselage is of standard construction ; wooden members and metal fittings, braced with piano wire and Roebling cable, dpubled at the forward section. It is built up in two sections, being joined immediately behind the rear cockpit. It is rectangular in section, tapering to a vertical knife-edge at the rear, having a maximum width and depth of 2 ft. 3 ins. and 3 ft., respectively. The forward portion, enclosing the engine, and the top turtle deck as far back as the rear cockpit is covered with sheet aluminium, the remainder of the fuselage being fabric covered. The cockpits are made as comfortable as possible, being well upholstered. A two-wheel type landing gear is fitted, the wheels being 26 x 4 ins. The axle, which is of if in. chrome nickel steel, is mounted by means of rubber shock absorbers on a pair of laminated ash hockey-club shaped skids. A vertical strut both fore and aft of the axle on each skid connect the latter with the fuselage. The two forward chassis struts are connected by a horizontal tie rod, and the chassis is cross wire braced at this point. The wheel track is 5 ft. 3 ins. Rattan hoop-skids are mounted on the lower wing tips, iust below the outer interplane struts, and a swiveljng skid is located under the tail. The power plant consists of a Curtiss 90 h.p. OX-5 8-cyl. V, coupled direct to an 8 ft. 3 ins. tractor screw. Mounted in the nose of the fuselage, immediately in front of the engine, is the radiator weighing 55 lbs. There are two petrol tanks, a small gravity tank of 5 gals, capacity located under the engine cowling, and a main tank containing 30 galls, under the front seat. The gravity tank is fed by pressure obtained from an air pump worked by the motor. A hand pump is also provided. The principal characteristics of the Eastern tractor a r e ;_span, upper 41 ft., lower 32 ft. 7 ins. ; chord, 5 ft. 3 ins. ; gap 5 ft. 6 | ins. ; stagger, 4 ins. ; dihedral, i � ; angle of incidence, 30 ; wing section, Eiffel 36; overall length, 27 ft. ; overall height, 10 ft. 6 ins. ; total area of main planes, 390 sq. ft.; speed range (full load), 40-75 m.p.h. ; climb, 4,000 ft. in 10 mins. ; gliding angle, 1 in 7.